As most of you undoubtably know, moving (house) is hard. We’re well beyond the stage (age?) of rounding up friends to help and buying them pizza and beer after a hard day’s work, so a few weeks ago we set about to find movers to get us from Lakewood to Pueblo. You may know (see my last post) that most of our stuff has been in storage for 18 months. That actually made this a relatively straightforward move–from a storage unit to a one-level small house. So I didn’t expect the kind of quote I got from a full-service (by which I mean loading, transporting, and unloading–no packing of stuff into boxes) mover. I digested the figure, then took a step back to consider our options. Friends/pizza was not an option, and we certainly could not move the big items by ourselves, or even the boxes. But paying for several movers to sit in a truck on the drive to Pueblo and back between the loading and unloading just didn’t make sense. More than one friend had suggested hiring help on both ends, so I somewhat reluctantly decided that was the best option, which meant I would get to drive the big truck. I had never driven a 26 foot moving truck, so it counts as a new experience. It actually was not too bad. I knew that our rental home had trees outside, so I opted for the insurance so I didn’t have to worry about inadvertent scratches. This gave me some peace of mind. The truck had automatic transmission, which was not really an advantage in town, as the transmission was extremely sluggish. The mirrors were great–I felt like I could see everything going on around me. 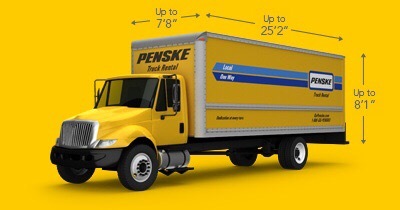 One potential disadvantage of the Penske trucks is that they sit pretty high. Although it was a chore to climb up into the cab, the high cargo floor was above the wheels, providing a completely flat loading surface. Our Lakewood movers expertly packed the truck with very little space to spare. They worked longer than I had scheduled, but I had planned for this, since the Moving Help system does not allow refunds for unused time, but most movers will work longer for additional on-site payment. A snowstorm was on its way, so we drove to Pueblo that night and camped in our new home (air mattresses can very useful). The drive was uneventful, if slow on the hills. The truck we rented had over 200,000 miles on it and part of the ride was very rough. Our Pueblo movers came the next day and unloaded the truck into the house, within the time I had scheduled for them (yay!). All in all, the move cost about half as much as we would have paid for full-service movers. I consider this pretty good compensation for a few hours driving the big truck. Moving is never easy! Sounds like you got through the bumps ok and are now settling in. Enjoy your new home! Thanks! We can’t wait to clear enough space so that we can have visitors! Sorry, We couldn’t get an airline ticket..
And we don’t have room yet…Soon.